Do you fully understand the famous “turning tendencies” which act on propeller-driven aircraft? It’s one of the first things primary students are taught when flight training commences. And the concepts are not all that complicated. Yet I’ve found that even long-time instructors often lack a proper understanding of at least one of these forces, specifically gyroscopic precession. I wrote Bob to tell him that I only count three “left” turning tendencies and ask him to identify the fourth one. He replied to my question by asking which three I was counting. I said slipstream, torque, and p-factor (propeller factor). Nope. That’s literally 180 degrees off. Rotate a tricycle gear aircraft and the aircraft will yaw to the right. Gyroscopic force is expressed 90 degrees ahead in the plane of rotation. The prop spins right (as seen from the cockpit). That means the force will act as if you pressed on the propeller disc from the LEFT side, and the plane will yaw about the vertical axis to the RIGHT. 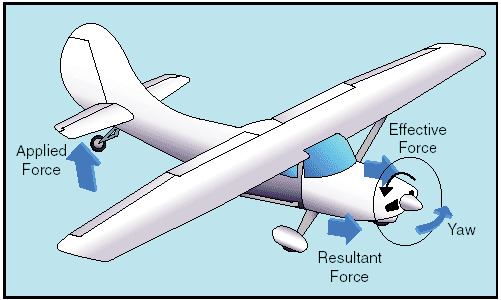 In a tailwheel aircraft it MAY be opposite, but the gyroscopic force is dependent upon how the airplane is rotated. Or should I say, whether it is rotated at all. In a Super Decathlon, I allow it to fly off in the three-point attitude. Since I’m not pushing the nose down (or up, for that matter), there is no gyroscopic effect. In the Pitts, on the other hand, I often rotate more to a level flight attitude before leaving the ground, so I get some left yaw. But gyroscopic effect is not a “left turning tendency”. We (aerobatic pilots) use gyroscopic effect all the time to yaw the plane left, right, up, down, flatten spins, accelerate spins, tumble the airplane end-over-end, and do many other things. Assuming you’re flying a SE aircraft with clockwise engine rotation, torque always wants to roll the plane left, p-factor always wants to yaw it left (ok, unless you’re flying with zero or negative AOA), and slipstream always goes around the fuselage the same way. But gyroscopic effect does not remain constant. It depends where the force is applied to that propeller disk. I believe this concept is poorly understood because most pilots don’t generate pitch or yaw rates with enough acceleration to really see the effect of gyroscopic precession. It’s also another example of how the training and knowledge of even experienced pilots are frequently incomplete without the benefit of that flying laboratory we call “aerobatics”. That is because when you increased the angle of attack at rotation, you increased the load on the or “bite” of air on the descending blade and decreased it on the ascending blade, increasing the amount of P factor, not because of gyroscopic precession. Then the aircraft was less affected by gyroscopic precession than by the other left turning/yawing forces, which is quite typical. Try jerking the airplane off the ground with a small but rapid application of elevator some time. You’ll notice the gyroscopic effect. Heck, you don’t even have to do it on the ground. Try it in cruise while running at high engine RPM, just make sure you’re well below Va.
in a single engined propeller when doing an aileron roll to the right or for that matter roll over the top or Cuban 8, there is often a necessity to give forward pressure, (holding the nose) passed the 90 degree point…what effect would that be? slip stream of gyroscopic effect. Rahim, I’m not sure what you’re referring to. Slipstream and gyroscopic effect are two different things.